The farm estate “Beim Öllerbauer” is situated at the heart of the Pöllauer Tal nature reserve. The region’s unique charm can also be felt at the establishment’s own bakery. You can’t miss the fact that there is lots of baking going on at Maria Heil’s kitchen: 20-kilogram sacks of flour, huge storage jars and countless egg boxes are piled up in the brightly-lit bakery. Besides the various biscuits and breads, the real highlight among the trained confectioner’s specialities is strudel. To make the dough, she takes flour, water, oil, salt, vinegar and one egg, mixes them together and kneads them thoroughly. Local tradition is to hit the ball of dough 99 times. After that, it must be left to rest for half an hour. Maria Heil often spends at least two days a week in her bakery. She always had a love for baking, and she first had the idea to sell her own baked goods more than twenty years ago as part of the Pöllau regional exhibition. At the time, local hoteliers and farmers were invited to present their products. The Heil family contributed their famous “Nervenkekse” biscuits, following a recipe from Hildegard von Bingen, and lebkuchen. The lebkuchen by Öllerbauer represent the local pleasure region Pöllau Hirschbirne: each of the local delicacies are produced using a cutter in the shape of pear, as they all contain what’s on the wrapping, namely the “Birn in der Birn” [pear in the pear]. The strudel dough is now rolled out on a damp cloth and patiently stretched out. ‘You should only marry somebody if they can get the strudel dough rolled out so thin that you could read the newspaper through it’, smiles the passionate baker. After that, the dough is smeared with warm butter. While one strudel is filled with apple slices, cinnamon and sugar, granddaughter Hanna is already preparing pears and curd cheese for the second one, and she doesn’t hesitate to sample the goods. In order to cater to all tastes, one half will also be topped with raisins. Finally, Maria Heil carefully twists the strudel dough together, brushes it with milk and places the tray in the large oven. The famous Hirschbirnwanderweg walking trail leads straight past the farm. If you follow the trail for a few steps, it will lead you to an idyllic holiday home. 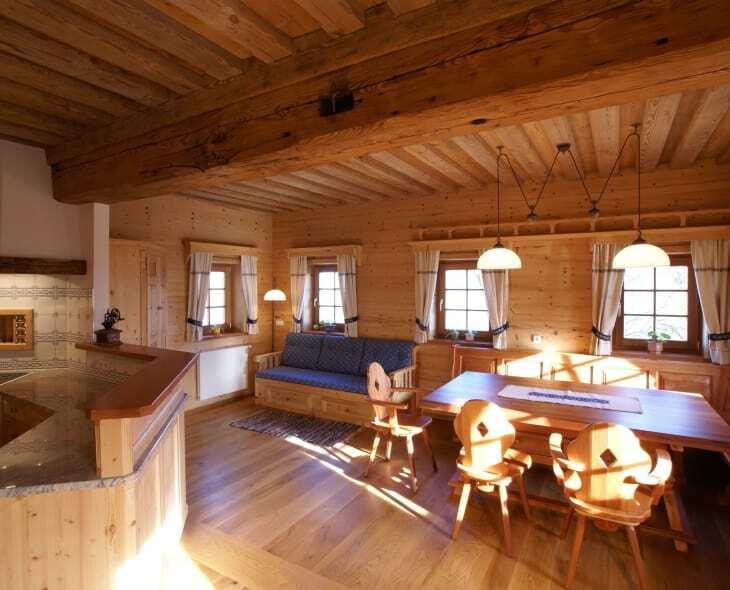 In a rustic country house, the family have set up two beautiful holiday apartments, including a sauna. Their son Martin and his wife take care of renting the holiday homes, as well as the farming. But Maria Heil places great emphasis on team spirit: In the past, she never had the opportunity to treat herself to a break with her husband due to the farm duties, so she wants to make this possible for her children.